Royal Flush Huis, Gameroom, Private Hottub, Slaapplaatsen tot 16, Bekeken! De Royal Flush Huis ligt hoog op de berg in Steamboat Ski Village, heeft een prachtig uitzicht op het zuiden van de Yampa Valley en de Flat Tops Wilderness Area die zich uitstrekken voor mijl. Deze berg vakantiehuis is een 3500 vierkante voet, 3 niveau ski lodge en meer dan 20 jaar heeft zich gevestigd als een van de beste eigenschappen van een grote groep, gezinshereniging, meergezins verzamelen of bedrijf retraite in Steamboat gastheer. De grote open haarden zorgen voor een gezellige ambiance en een speelzaal biedt eindeloze entertainment voor iedereen. Straatniveau Parkeren en Begane grond Entree: Geen steile oprit of stappen! Deep parkeerplaats die ideaal is voor sneeuwscooter trailers. Bezoek ons ​​op Steamboat Springs Chamber of Commerce, lid sinds 2000. Steamboat Springs, Colorado. Vakantiehuis Verhuur # VHR-07-17. Alle vijf badkamers zijn mooi bijgewerkt. Familie beheerd en eigendom beheerd. Lid van de Steamboat Chamber of Commerce sinds 2000. We loved our stay at the Royal Flush. It was spacious, convenient to the slopes and town, and the owners made sure we had everything we needed (including poker chips). We also enjoyed the pool table and hot tub after some great ski days. This house was perfect for our large group. We had several couples and 1 infant and the house had plenty of space and room for everyone. It is nice because it is in a residential neighborhood, but still only 3 minutes from the base of the mountain. Everything was clean and well maintained. We had one small hiccup when we arrived, but the owner was super responsive and responded immediately. Would highly recommend this house. This was the PERFECT house for myself and the 11 other female family members for our reunion trip! 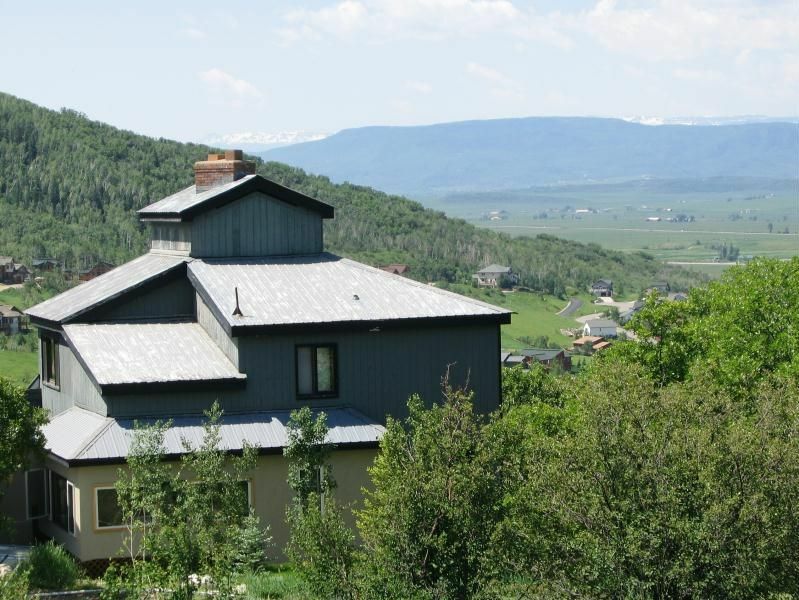 The Royal House was the PERFECT choice for our family reunion to Steamboat Springs! We went for the Hot Air Balloon Festival and Pro Rodeo Events! It accommodated 12 females very well with the 4 large bathrooms and sleeping for 16! We had all the space we needed and more! The out door seating was the same, more than enough! The location for this event was SPOT ON because we didn't have to leave the house to watch the hot air balloon event, we saw it all from the comfort of the deck! The home was very clean and had everything we needed! The kitchen and eating areas were perfect for all of us to be seated in one place as well! The owner and care taker were very accessible when we had a need come up and they took care of it on the spot! We will definitely be returning if we can get everyone in one spot at the same time again! The drive to town is only a few minutes and the views from this house are breath taking! We had a fabulous and memorable time! Loved the 'cousins' room complete with 4 singles & a double. Loved the hot tub and gorgeous sweeping view. Kitchen situated so that the cooks can socialize with people in the living room. Kitchen very well stocked and functional. Loved the game room. Loved the upper bedrooms and very nice bathrooms all around. Fireplace, chainsaw bear, decor, homey and wonderful. Extra blankets and everything we needed. Oh and the laundry! Soooo convenient, clean, centrally located new machines with a nice open countertop for folding. The entry is perfect for skiers and equipment. Nice big driveway. Owners extremely kind and helpful. A few things to note: kitchen table seats 8 (I think) so not everyone in a large group at once; there is another table for 4-6. No sharp knives. We could've used more toilet paper :). There's a tricky hairpin turn uphill, not ideal in icy/snowy conditions without 4-wheel drive. Our rental van could not make it once, but there is a longer way around. The lower bedrooms would benefit from another bathroom nearby, but overall plenty of bathrooms in the house. There is a bit of managing various doors to keep the heat in, but that's to be expected in a large and versatile house in cold climate. We had a WONDERFUL stay; thank you!! Our stay at the Royal Flush House was fantastic. All Five of our kids came from all over the world and it was wonderful to be able to provide all of them with a room of their own. The rooms are perfectly laid out so that everyone could sleep in as late as they wanted and not be disturbed by early risers. The house had all the amenities our family needed and the kitchen has great cookware. The entire family felt like being in Steamboat Springs for only a week was not long enough to get in all the desired activities. Even though we took in everything from the Gondola and brunch, hot springs, lake, waterfalls, slides, float the river and of course lots of hiking! Beautiful location. Thanks to Rick for helping us get settled in the house the first day. This trip served as a family reunion for 7 adults and 7 children (one grampa, three siblings and spouses, and 7 kids from 1 to 11). There was plenty of space everyone. The kitchen and bathrooms were very well stocked with utinsils and supplies. We cooked in almost every night, so it was nice to have all the tools needed for cooking. The location of this house offered a beautiful view and was very close to the base of the ski area. Some of the roads to the house were a little steep for our rented minivan after several days of snow, but no issue for the 4x4s that were rented. The house had shovels and brooms to clear the snow and a good area in the back for the kids to enjoy the snow. The fireplace with pre-split wood made the house very comfortable. On sunny days, the sun room offered a nice warm area to shed the layers of winter clothing. All families thoroughly enjoyed the hot tub as well. The owner was very accommodating and a pleasure to deal with. Thank you for a great vacation! Andere activiteiten: Geniet van de vergezichten en ontspannen, relax, relax!